Electro Zinc Plated Carbon Steel (ZI) parts are suitable for installation in ductile panels with a maximum recommended hardness of 80 HRB. 300 Series Stainless Steel (A2) parts are suitable for installation in ductile panels with a maximum recommended hardness of 70 HRB. Part number is made up as follows: (Type)-(Thread)-(Length)-(Material/Finish code) For example: NFHL-M3-10-ZI (Reduced Head Stud-M3-10mm long-electro zinc plated carbon steel) NFHL-M4-12-A2 (Reduced Head Stud-M4-12mm long-stainless steel) Use part designation NFHLD to specify a dog-point thread lead-in (special order). Self-Clinching Reduced Head Studs provide strong low displacement captivated male threads in thin panels and are suitable for installation closer to the edge of the panel than normal Flush Head Studs. Utilising a special proven castellated clinch feature, this fastener has good torque-out, pull-through and push-out characteristics whilst providing a flush finish on the underside of the panel, meaning that minimal surface finishing is required after installation. Like all self clinching fasteners they are installed using a parallel squeezing action, so require access to both sides of the panel. 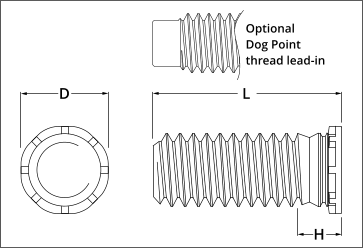 Reduced Head Studs are available in a range of thread sizes and lengths, manufactured from electro zinc plated steel, 300 series stainless steel and are suitable for installation in ductile steel and aluminium panels with a recommended maximum hardness of 80 HRB for steel parts and 70 HRB for 300 series stainless steel parts. 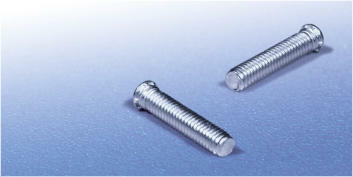 Reduced Head Studs can also be supplied with a dog-point thread lead-in to aid component assembly.